to discover at least where it is that we have been so startlingly set down, if we can’t learn why. My sakiori (behind) with a traditional Japanese piece. So more often than not, her words compel me outdoors, as do Mary Oliver’s poems or Robin Wall Kimmerer’s essays on our participation in this world. Participating, as a seer, a person trying to have what Rilke called “the right eyes,” is a full-time occupation. Unless we get lazy and neglect our duties, which is easy to do. Easy to get pulled into online discussion or news, easy to binge-watch something as an escape from the arduous act of thinking. I try to increase the time away from such distractions (unless the online stuff is truly feeding a worthwhile train of thought, which happens.) I turn to Ursula LeGuin and her mother’s wonderful writings about Ishi, their tragically famous friend. I read David James Duncan and Robin Wall Kimmerer, Tim Ingold and Dr. Leticia Nieto. Most recently I read Elaine Pagels Why Religion?, a gift from my father-in-law who, as a Biblical scholar, has always been a fan. They are all pointing down a similar road, leading away from colonialism and the old, destructive narratives that I somehow grew up with. I’ve been trying to dismantle that ideological box for a long time, and I keep finding new tools. But it is an uphill trek. For every sentence I manage to write here, there are countless thoughts and potential words swimming around, uncaught and fleeting. At any rate, I’m trying. My first project with the smaller bamboo reed that I made at home, on my own, is a sample of sakiori, a weaving made from torn up fabric. 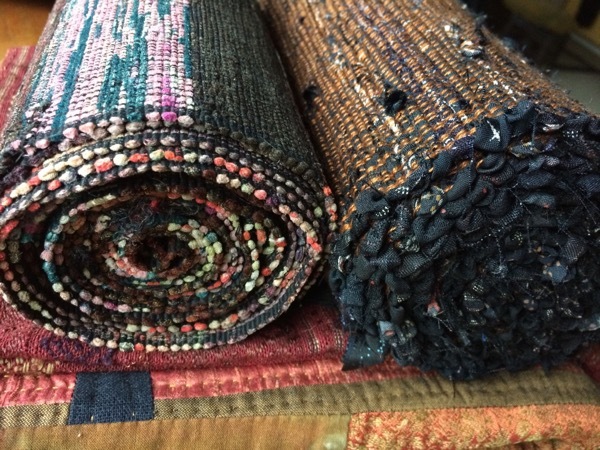 The weft is made of strips of kimono silk fabric. I’ve been preparing the strips for some time, and this is the warp I impulsively wound when I arrived home in December (last post.) It wove up quickly, and was finished in time to show friends in mid-January. 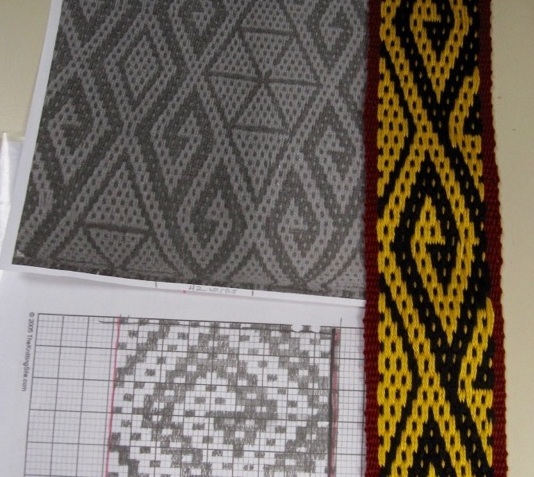 As with most of my weaving thus far, it is nothing more or less than an attempt to make a certain type of fabric, to see how it might be done with my backstrap loom situation. I’m pleased with the result, am interested to work with finer strips of fabric, and do not know what I will “do” with this piece at the moment. Here’s the setup. Don’t be confused by the rolled up weaving on the floor beneath (extra sticks at the top of the photo.) This one has lease sticks, a fat shed stick, string heddles, two swords and a reed. I had to beat with the sword rather than the reed to get this packed nicely. Whenever I come home from being away, I tend to re-assess, to inventory my projects, ideas and materials. I need to go around and touch things, fluff the space, remind myself of what was going on. At the same time, I tend to be most open to doing something completely new during this re-entry phase. This was the case yesterday. I’m home, only for a week, with warps on the looms, fiber on the wheel and spindles, and plenty of things in some state of generalized progress. But as I moved through my studio space, every corner, bin, and shelf called to me with fresh voices, things that wanted to jump the queue and happen now. Glancing at these papers in a baskets, I had the urge to use them all, immediately. I see papers and paints and pencils, and itch to pick them up. Then I see fibers lurking in a bag and start to think about enticing new combinations. What I ended up doing, though, was pouncing on the box labeled Saki Ori, and saying This is it. This happens today. It had been a long time coming. 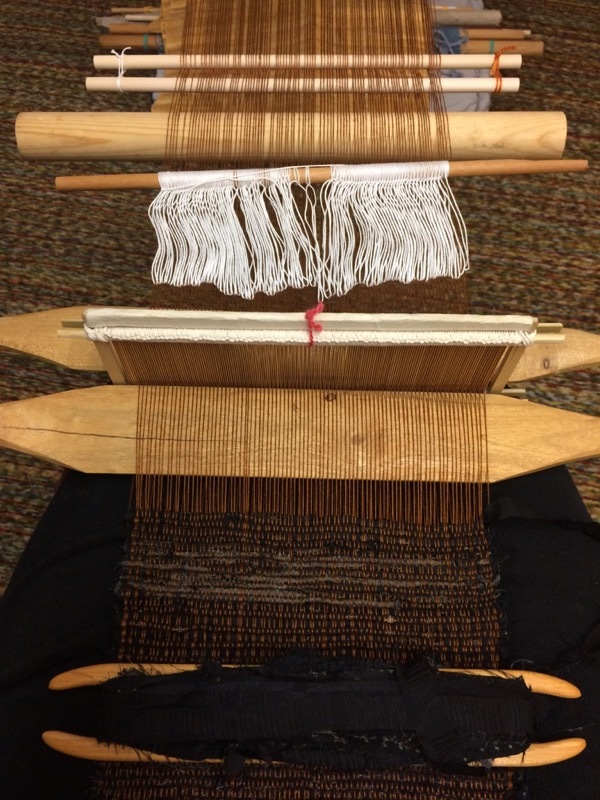 I prepared the kimono silk weft many months ago, maybe even a year ago, I knew what I wanted to use for warp, and I knew I would use my 8 inch bamboo reed. So it was all ready to go, awaiting the moment of ignition. I spent the day preparing a whole new warp, musing on the materials visible through the warping frame as I wound. New warp on frame, with handspun Nomad Caravan peeking through. Sleying the bamboo reed. I think this is 20/2 cotton (unidentified, from a destash sale), and the reed is 22 epi. This part is really quite relaxing, if I’m in no hurry. 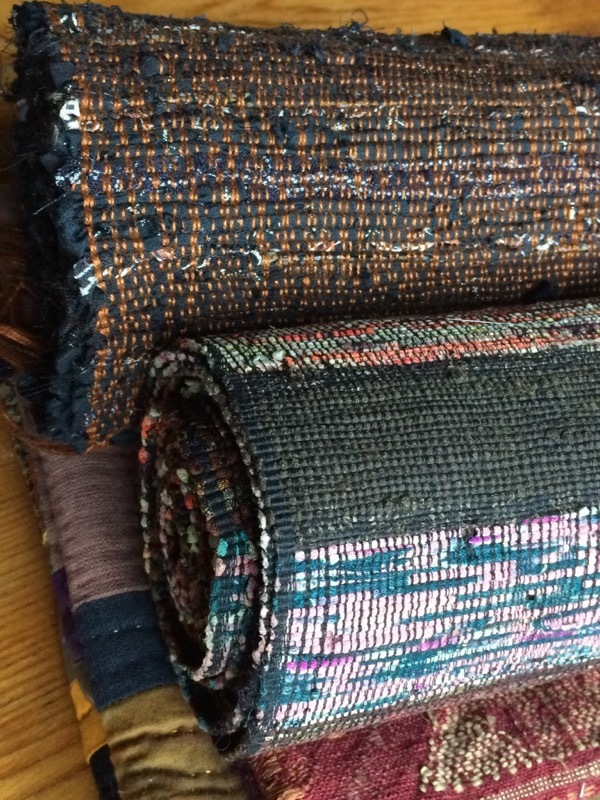 Japanese sakiori obi, on top of a patchwork camel trapping. Work in progress. I find the irregularities mesmerizing. Kimono silk strips for weft, hanging around with some random yarn. The various vignettes in my studio continue to intrigue: the sakiori weft balls themselves, before being wound onto shuttles, begin to make tentative conversation with some aged handspun cops I picked up at the guild auction. The air hums with possibilities, even as I commit to a single project for hours and days.